It has been quite a busy year for me and I almost couldn’t make it to a football match this year. On a bit of a whim, I finally found a date, October 30, 2011 where a friend and I could make it to a football game. For those who have read my previous posts on football, this will not be too different. I went out to my perennial football game out in Chofu, western Tokyo. This time I attended what is called the “Tokyo Derby”. The Tokyo Derby has several meanings. There are three major definitions for Tokyo Derby. The first is a horse race that is run in Tokyo in June. The second is a match between the Yomiuri Giants and the Yakult Swallows. These are the two major baseball teams in Tokyo with their own respective stadiums. Whenever they play each other, it is part of the Tokyo Derby. The baseball derby is not as famous as the teams meet many times over the season so it doesn’t receive much press. 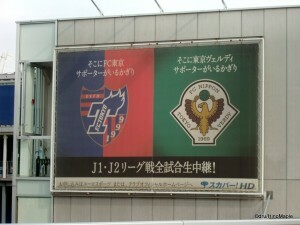 The third and recently the rarest is a match between FC Tokyo and Tokyo Verdy. Both are football teams representing Tokyo and both play in the same stadium, Ajinomoto Stadium. The last time there was a Tokyo Derby for football was 3 years ago in 2008*. That was the last time both clubs were in the same league. This year, FC Tokyo was relegated into the J2 league which gave both teams a chance to play each other twice. Note: There are two derbies in 2011 and the game I attended was the second derby of the year. Prior to that, it had been 3 years since the last Tokyo Derby. FC Tokyo is currently the more popular club in Tokyo. They have more fans and you can see their merchandise throughout Tokyo. Tokyo Verdy is like a neglected adopted child, please pardon the simile. In fact, Tokyo Verdy is more prestigious of the two clubs having more championships to their name. The biggest problem was that the club lost a lot of their fans when the owners decided to move the team to the current location. At the end of the 90s, the club itself had been suffering. They were in a very competitive situation. Originally located in Kawasaki, and called Verdy Kawasaki at that time, the team had to fight with another team from Kawasaki as well as two teams from Yokohama. Kawasaki is located between Tokyo and Yokohama but for most people, Kawasaki is considered a suburb of Yokohama rather than Tokyo. The club made a bold decision to move to Tokyo but the timing couldn’t have been worse. Their move was at a time when FC Tokyo was starting to attract more money and fans and FC Tokyo had just been promoted to the J1 league the previous year. 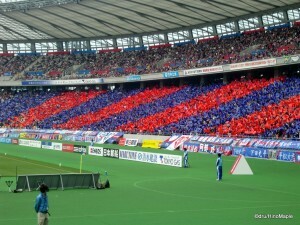 In fact, FC Tokyo has always had more fans since Tokyo Verdy moved into Ajinomoto Stadium. For a few years both teams were in the top league, J1. In 2005, Tokyo Verdy was relegated to J2 and they have languished as a midlevel team in J2 ever since. They did get promoted in 2008 for just one year before being relegated back to J2 the following year. 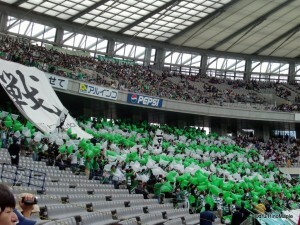 Unfortunately, I doubt that Tokyo Verdy can return to J1 anytime soon but who knows. As for FC Tokyo, last year was a terrible season for them. They had struggled and were relegated by a 2 point margin. At the beginning of the 2011 season in J2, they didn’t do so well but they recovered. 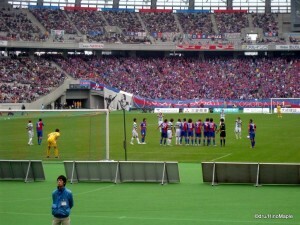 At the start of the year I thought I would punish FC Tokyo by not attending a game. I thought they needed some “tough love” but towards the end of the season they were dominating the J2 league table with only 5 games remaining. They are nearly guaranteed to be promoted back to J1. With this in mind and the fact that it could be the last Tokyo Derby in a while, I decided that now was the time to head to a game. I pretty much decided just a few days before the game itself and picked up my tickets at the venue. I have been to Ajinomoto Stadium three times now and this would be my fourth. I figured that I knew everything there was to know about going to a game at Ajinomoto Stadium, but I was wrong. The details of the stadium and my experience is very similar to my previous posts about going to Ajinomoto Stadium. One of the first new things that I experienced was purchasing tickets. I had both pre-purchased tickets and purchased tickets at the venue. I thought that arriving an hour early would be more than enough for me to get tickets and a seat. We had started by standing in line at the box office but learned that they set up a special tent for home team fans. 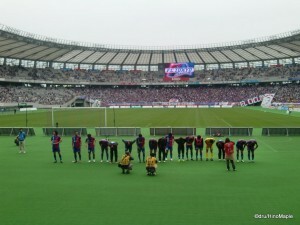 The lower bowl of the stadium was mostly reserved for the home team, FC Tokyo in the game, and there was no need to reserve seats. It was all free seating. I never knew that a small side tent was set up for quick sales of unreserved seating tickets and saved myself a good 20 minutes. Upon entering the stadium grounds, everything was typical. Souvenir shops and expensive food and beer could be found everywhere. We kept getting side tracked with various souvenir shops but we eventually made it to the main area. I had hoped to sit near the centre line as we were a bit late, but we had to keep going. 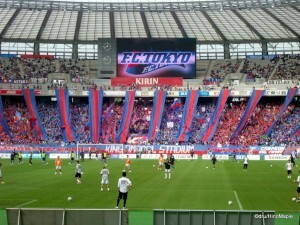 The area behind the main goal was reserved for the “visiting” fans but since FC Tokyo had the “home” advantage, Tokyo Verdy was limited to one small section. In fact, there were so many FC Tokyo fans that they had to keep opening up sections until there was just half a section to separate the fans. It was the first time I had seen that happen and it was nice to see that they would open up sections when necessary. Unlike the previous games, FC Tokyo had a good turn out and the attendance for the game ended up being just under 36,000, a very healthy attendance for a 50,000 capacity stadium. The game itself was somewhat surprising. I was commenting on the game with my friend and we both agree, FC Tokyo didn’t deserve a win that day. They had played with several of their top players being rested and they didn’t seem to be able to control the ball properly. In fact, Tokyo Verdy was the dominate team and very hungry for a win against their rival. The game wasn’t as interesting but thankfully by the end of the first half FC Tokyo scored a goal in extra time. In the second half both teams seemed to pick up their game a bit. The game had lots of spirited playing at points followed by a lull. Tokyo Verdy kept applying pressure on FC Tokyo. They had a corner and FC Tokyo had scored an own goal. It was really depressing but somewhat expected from a strong Tokyo Verdy. The game continued with a few opportunities on both sides and ultimately, the game ended in a 1-1 tie. It was the first time that I had watched a J2 game and I am happy to say that the quality of the game was pretty similar to J1. It doesn’t matter if the team is in J1 or J2, as many of the teams in Japan are of similar quality. The bottom half of J1 and top half of J2 can easily fight with each other. In fact, Kashiwa Reysol was promoted to J1 this year after being relegated to J2 for a year and they are currently at the top of the leaderboard. It seems impossible to think of a J2 team becoming J1 league champions in their first year back but anything is possible when teams are of similar calibre in both leagues. With ticket prices being the same for FC Tokyo, be it J1 or J2, I would say that the prices are worth it regardless of which league the team plays in. This entry was posted in Football (Soccer) and tagged Ajinomoto, Ajinomoto Stadium, Chofu, FC, FC Tokyo, Football, J-league, J1, J2, japan, Japanese football, Japanese Soccer, Soccer, tokyo, Tokyo Derby, Tokyo Verdy, Verdy, Verdy Kawasaki, Yakult Swallows, Yomiuri Giants by Dru. Bookmark the permalink.